to get a second image - "Cute Bunny" from Bugaboo. I embossed the background with my "swiss dots"
it's easy, quick and effective! added a diecut word... love. So sweet! This would also fit the theme over at Sunny Day Crafting. Thanks for linking up at Cardz 4 Galz! Such a fute fun card,a lovely dessign with such a cute little rabbit and lovely setails!! Thanks so much for joining us along with the Simon Says Stamp Wednesday Challenge. Awe! 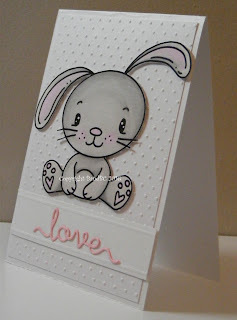 This is adorable - love the CAS and embossing is a great touch! 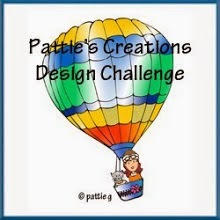 Thanks for joining the challenge at Little Miss Muffet Stamps! A really cute CAS card. 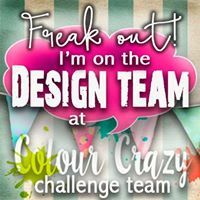 Love the image you have used an coloured perfectly. Thanks for joining in with our 'Child's Birthday' challenge at Passion for Promarkers this week, and hope to see you again. I absolutely just love this card, the bunny is precious !! Lovely card and perfect for our challenge this week at CRAFTY CATZ in our Baby challenge thanks for sharing and good luck hope to see you back next week. This is a gorgeous card, such an adorable image. Great card. 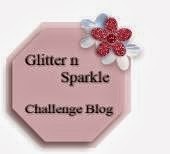 Thank you for joining us over at Unicorn Challenge Blog. Look forward to seeing you again. A great card - love the embossing. Thanks for joining us at Cardz 4 Galz.